Hunts Point Staging Area Remediation - Bronx, N.Y.
Jett Industries, a subsidiary of Kiewit Corporation; is awarded the contract to convert the existing 1 acre staging area into a park. The jobsite is located in the Bronx, adjacent to the Hunts Point Barreto Park. 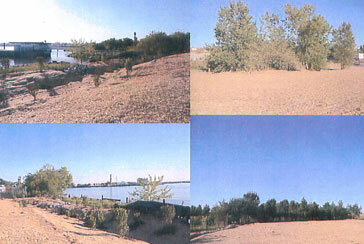 The existing jobsite used as a dump ground and grown weeds and vegetation over the years. Work consisted or clearing and grubbing of the vegetation, grading the existing surface (subgrade) to proposed levels, backfilling with select fill up to 2 feet high. Backfilling followed by placement of topsoil, hydro seeding and planting. Major quantities include 2600 cubic yards of select fill, 1,200 cubic yards of top soil.